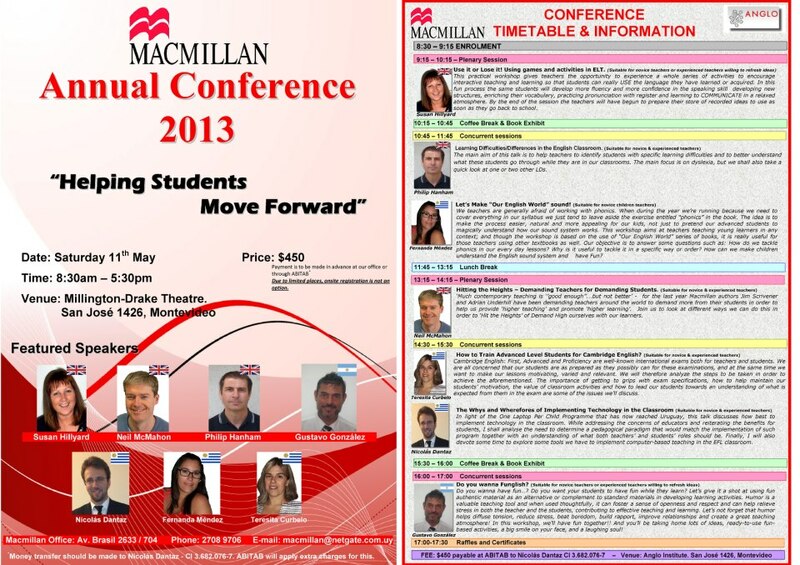 This is a talk that I first did at the Macmillan Annual Conference at the Anglo on Saturday May 11th 2013. I then repeated it as a workshop at International House in Buenos Aires on Friday 31st May 2013 at our weekly interschool teacher development meeting. 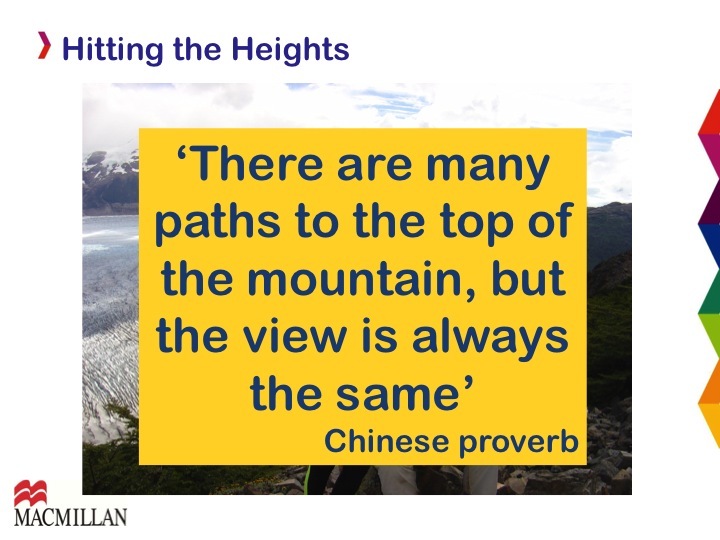 They were two very different and very worthwhile experiences and they both showed different ways in which using the ‘Demand High’ meme (as Adrian and Jim suggest we call it) can be a very powerful reflection tool for teachers of all experiences in all contexts. A little meme example for you – is this what A&J meme? But let me talk you through them a little, in case you’d like to join us on our reflection journey up the mountain, or would even like to give a similar workshop yourself. 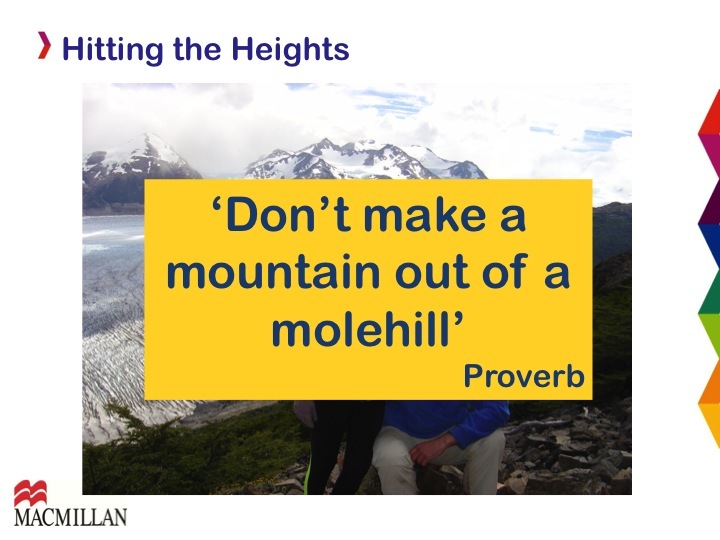 I started by explaining where my mountain metaphor came from – my wife wanting to climb Aconcagua while I wanted to go to the IH Dos conference in London. Since I ended up not being able to go, I ended up enjoying the videos of the talks on the IH World website. 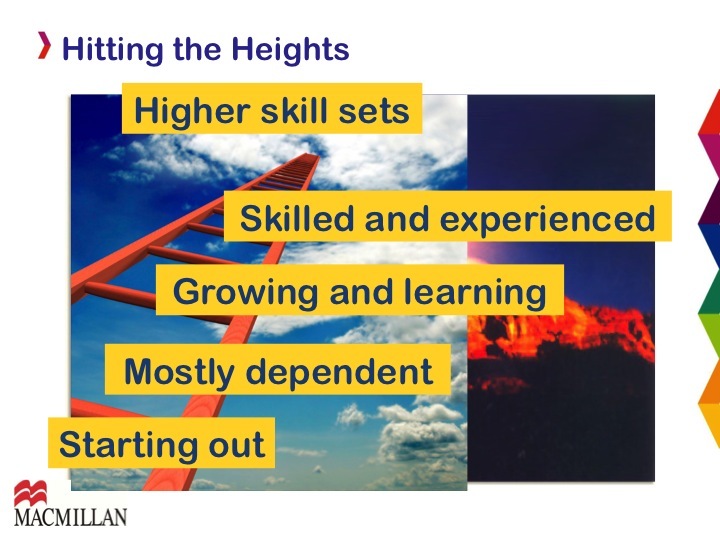 First of all Jim Scrivener takes us through the reasons for Demand High and uses a ladder to explain why teachers can use Demand High as a way to continue developing their higher skill sets. 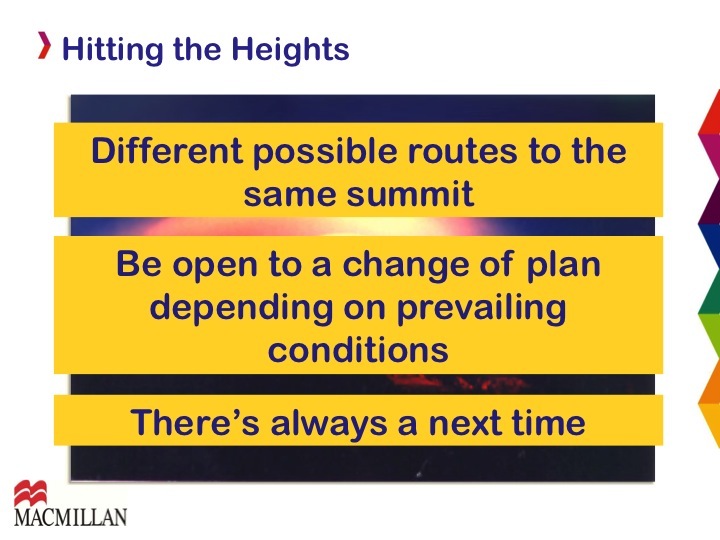 and then Adrian gives us some practical examples of putting Demand High into practice. One main tenet of Demand High is the focus on three areas of teaching and the teacher – our attitude towards our students, where we focus our energy and whether we are continuing to improve our techniques. The attitude shift they call for is key to the whole concept of Demand High – are we really pushing our students to do the best they can? Are we demanding enough of them? Or is our attitude more lax than that – ‘They’re doing enough’, ‘I doubt they can do much better’, ‘That’ll do’. 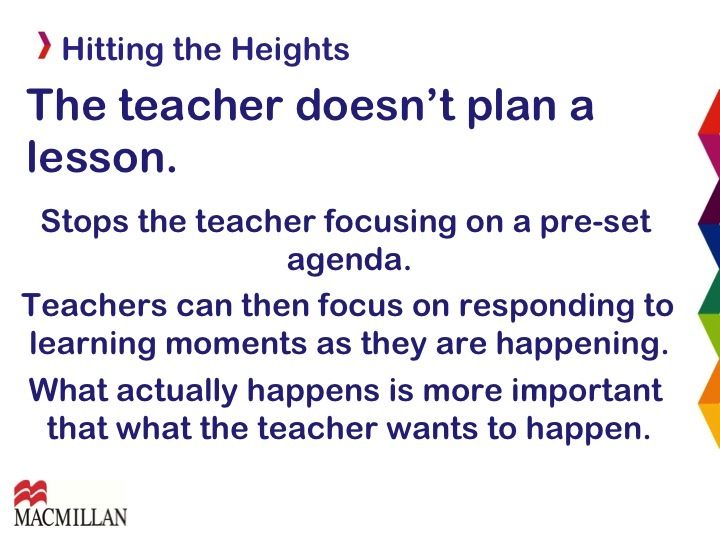 Most of my audience agreed that we do fall into this trap too often and we do need to keep ourselves focused more on pushing our students (and also getting them to push themselves). In order to do this, we also need to focus our energies on high demand teaching and this is another key point that Jim & Adrian ask us – are we actually running away from the real teaching that needs to be going on in our classrooms? Are we afraid to get our hands dirty? Learning a language is a messy, difficult job and we need to be putting in the detailed ‘grimy’ work to get it done. The Communicative Approach in particular has led us (allowed us) to facilitate the students communicating, doing things (mechanically? ), but are we getting involved enough in teaching forms and giving constructive feedback that ensures they are really making progress and improving step by step? And finally, in order to do this, are we using the best, most effective techniques to do so? Are we armed with ways of helping our learners learn? Are we equipping them with the best techniques for learning by themselves away from the classroom? Are we continually striving to explore new ways of doing and reflecting on the most effective ways of teaching in the different contexts we find ourselves? Are there enough ‘nudging interventions’ in our classes? Most of us seem prepared to answer No! to most of these questions, which is why I find this session such an excellent reflective tool. It makes us ask the questions of ourselves, and hopefully as we now move into the detail, provides some possible answers too. 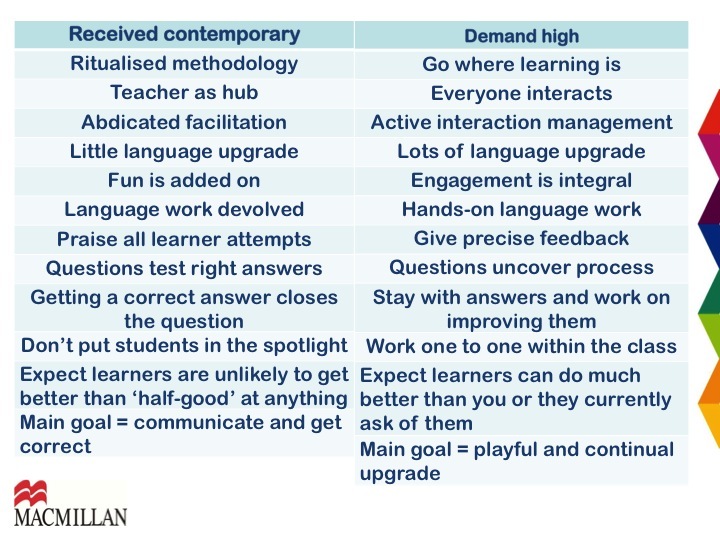 Jim goes on to compare received contemporary ideas with their suggestions for Demand High teaching. In the workshop we tried to match these up ourselves, but here you have them in their full glory. First of all consider the left hand column – do you agree with Jim that these are part of the status quo? Do they happen in your classroom? Steve suggests and we probably mostly agree that it’s received wisdom to plan your lesson. But Steve asks us to consider what the Demand High results of not doing this might be, listed in the above slide. 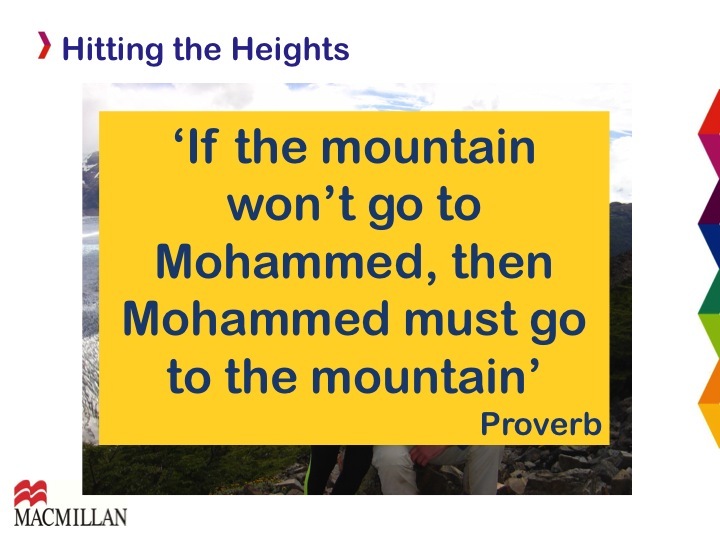 I then take these to the wisdom of the mountain, and come up with the responses in the slide below. Sometimes I completely agree with Steve, sometimes I think he goes a little too far to elicit a reaction and sometimes I think he’s missed a point. As you work through the slides and compare the two views, you can make up your own mind, but the idea of the activity is to help you see where you stand on some fundamental concepts of classroom practice. Plenty of theory to be getitng on with then. But what about putting it into practice? Jim and Adrian don’t suggest too many ways of actually Demanding High in the classroom. Adrian has a pronunciation suggestion (of course!) which is an excellent drilling technique I’d never come across before and it does work really well. It simply involves getting the studnets to hear your model of the language before they repeat it themselves, to hold on to their mind’s recording of your voice and repeat it as many times as they can before they lose it (normally after around five seconds) – try it out in class, it’s quite a powerful technique. Differentiation is an area I’ve not thought about too much since I tend to teach monolingual classes which are pretty well levelled, but I know it’s an area I should be considering more even within this context. I found a helpful self-reflection task on how differentiated your teaching is, which also gives some practical ideas about how to go about doing it. Are you more to the left or the right of the differentiation clines? As with all these ideas I could blog a separate post on them, so keeping it brief here. And as a teacher trainer, I always like to encourage observation, since I consider it the most effective development tool. 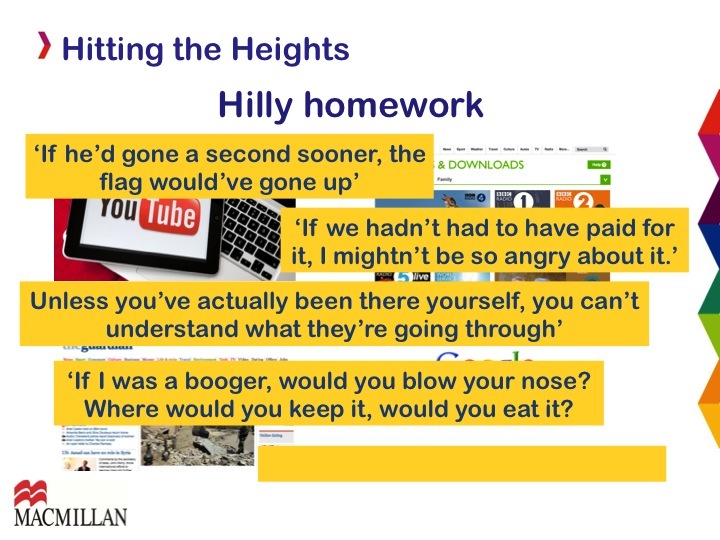 So here are a couple of Demand High peer observation tasks for you to try out when watching and being watched. It’s a very simple idea with very little teacher preparation, but really engaging and personalised for the students. One I’m going to use again and again, tweeking here and there of course. So we’ve reached the summit of the mountain and the view looks pretty spectacular. We’ve had some tough times on the journey and had to look inside ourselves to find the attitude, energy and techniques to get to the top, but with a little help along the way from Jim, Adrian and Steve we made it! Now all that’s left is to share the tale of your journey with friends and family once you get back home. 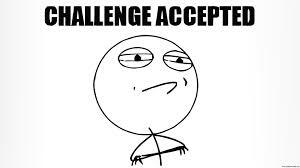 How are you Demanding High of yourself and your students? Which areas are you going to choose to work on? What Demand High techniques and activities are you adding to your teaching? Please do share with us here, we’d love to hear from you. 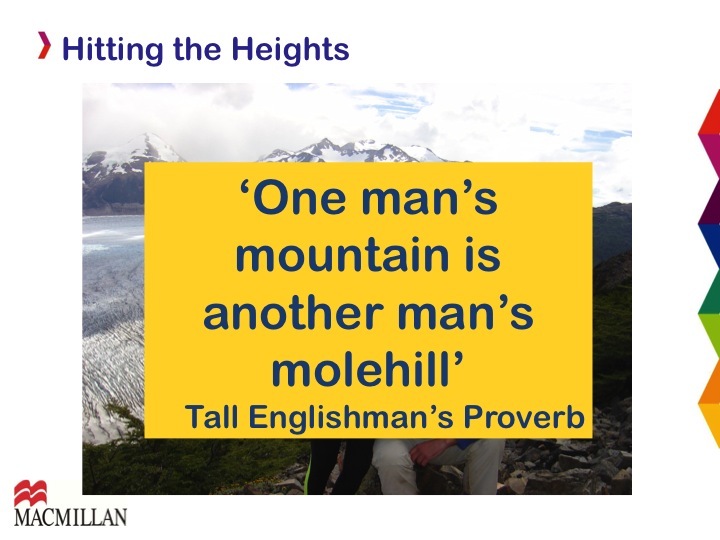 Congratulations on Demanding High, enjoy the view, and remember by Demanding High, you’ll Hit the Heights!